Fluorspar (also referred to as fluorite) is a mineral composed of calcium fluoride, CaF2. It is a naturally occurring mineral that tends to form in rocks that have been subjected to hydrothermal activity. These rocks can also contain metallic ores which may include sulfides of tin, silver, lead, zinc, copper and other metals. Fluorspar / fluorite mineral can also be found in some limestone and dolomite deposits. Fluorspar is used in many different processes throughout the chemical, ceramic and metallurgical industries, and is therefore split into three different grades: acid, ceramic and metallurgical. The highest grade fluorspar, or “acid grade fluorspar,” is 97% or more CaF2 and is used to produce hydrogen fluoride or hydrofluoric acid by reacting with sulfuric acid in the following reaction: CaF2(s) + H2SO4 → CaSO4(s) + 2 HF(g). The hydrofluoric acid produced by this reaction is then converted into fluorine, fluorocarbons or other diverse fluoride materials. The second highest grade fluorspar, or “ceramic grade fluorspar,” is 85-95% CaF2 and is often used to manufacture glass, enamel and cooking utensils, while the lowest grade fluorspar, or “metallurgical grade fluorspar,” is 60–85% CaF2 and can be used to help lower the melting point of raw materials used in steel production. This aids in removing impurities and also in the production of aluminum. 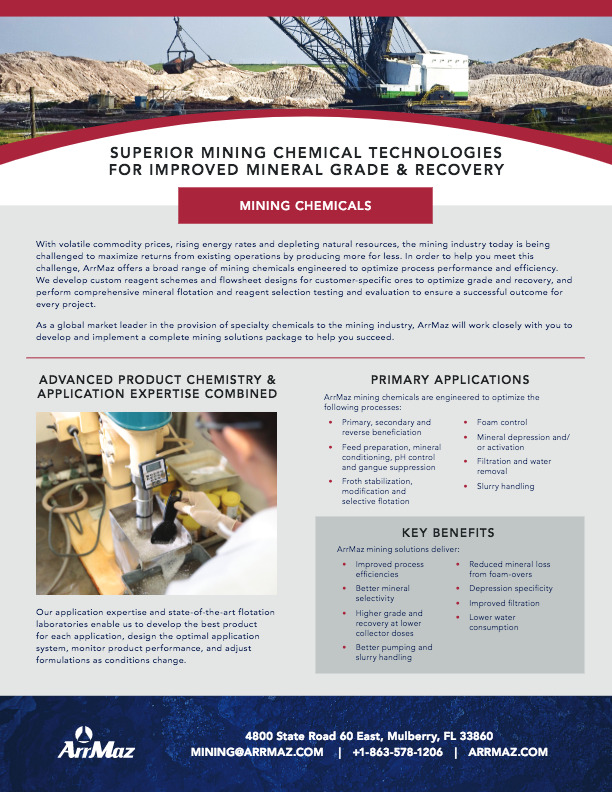 ArrMaz helps producers maximize their grade to get the most out of their fluorspar ore. We custom develop chemicals to help our customers achieve their desired selectivity, recovery and reagent consumption. Our custom designed flowsheets for fluorspar / fluorite mineral flotation are often composed of a rougher float followed by several cleaner floats, in order to achieve the highest grade fluorspar. We also assist in identifying adjustments that operations may need to make to their process such as heating the conditioning pulp or using modifying agents if carbonate minerals are present.